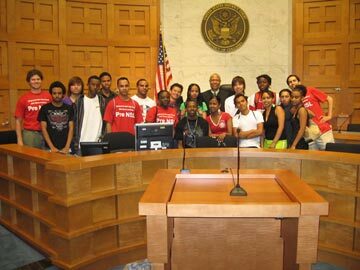 Students visited a federal court in washington, DC where a judge talked to them about his job. 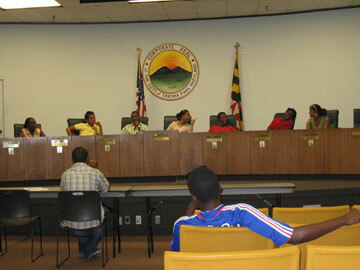 Students learned about the local goverment's responsitibilities and how the goverment work in Takoma park, Mayland. This past summer, students from ESOL who were going to take the government class in the new school year had a special program to learn about the national, state, and local governments. This program was meant to help give students the basic idea of how the U.S. government works. The two teachers, Mr. West and Mr. Grossman, who helped with this program, wanted to give the students an idea of how the government really works. The U.S marshals showed the students where an accused felon would be held until a trial begin. The marshals showed the students how she uses handcuffs on a defendant. All of the students who attended the program were born outside of the U.S., so this was something new for them. The teachers also hoped it would help the students pass the Government High School Assessment. I think all of us who took this program liked it because the program gave us an opportunity of knowing the government and being successful in the government class that we are taking now for credit.